Farm to Freezer Sale: Keep It Local All Year Long! The news this past week that the Farm Bill failed to pass the U.S. House of Representatives by just 15 votes came as welcome news to many food system advocates. However, it is likely that this will be only a temporary delay before legislation comes back before both the House and is introduced in the U.S. Senate. More than ever, food co-ops and their members need to make their voices heard. cipants included Roger Noonan, Justin Chase, a diversified farmer from Massachusetts, and Mary Castonguay, NEFU Board Member, Maine organic dairy farmer and Organic Valley member. Our goal was to make it clear to our policymakers that farmers and consumers are united in their opposition to the current Farm Bill. The NFCA’s partnership with NEFU is part of our effort to advocate for a more healthy, just and sustainable regional food system. 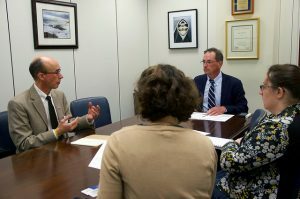 Benefits of the collaboration include opportunities for co-ops and their members to participate in initiatives such as the Farm Bill fly-in as well as events such as the College Conference on Co-operatives, resources for projects such as Healthy Food Access, regional sourcing, and technical assistance for food co-op Start-Ups, and support for small farmers trying to grow their businesses and navigate regulations such as the Food Safety Modernization Act (FSMA). To stay up to date on the Farm Bill, please click on this LINK. And to take the next step by becoming a member of NEFU, visit https://newenglandfarmersunion.org/join/. The New England Farmers Union Needs You! If you care about where your food comes from and want to support the people who produce it, consider joining NEFU as a Friend of the Farmer for just $15. Your membership will help ensure that our region’s producers and consumers are heard by policy makers here at home and in Washington, DC. For more information, please visit www.newenglandfarmersunion.org. The Neighboring Food Co-op Association (NFCA) is an affiliate member of the New England Farmers Union (NEFU), representing our commitment to collaboration among consumers and our region’s family farmers and fishermen to influence food system policy and build a more vibrant, resilient and co-operative food system in the Northeast. On Saturday, May 5th, over 30 organizers representing 12 Start-up Food Co-ops from across the Northeast gathered for the Neighboring Food Co-op Association‘s (NFCA) Third Annual Start-Up Workshop Day, organized in collaboration with Food Co-op Initiative (FCI) and hosted by Monadnock Food Co-op in Keene, NH. Hudspeth worked in collaboration with Jacqueline Hannah, Assistant Director of FCI, to plan the day packed full of peer-to-peer learning, case studies, and workshops covering pressing issues for the successful launch of new food co-ops. In addition to presentations from NFCA and FCI staff, start-up peers Siobain Mitchell, Board President of Assabet Village Co-op Market, presented on ‘Recruiting & Retaining Board Members,’ and Nick Landry, Board President of Granite City Grocery, described the common challenge of Membership Growth, setting the group up to workshop challenges together and then come up with solutions. Thanks to our friends at Cooperative Development Foundation, Dorsey & Whitney LLP, & Equal Exchange for supporting this day, and here’s to the next generation of start-ups organizers rolling up their sleeves and doing the hard work to meet their communities’ needs! 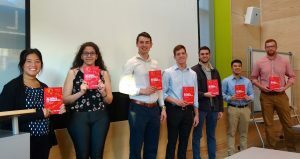 This Spring, NFCA was proud to host 4 undergraduates in internships with local co-ops as part of the UMASS Amherst Department of Economics Certificate in Applied Research on Co-operative Enterprise. For the past few years, the Neighboring Food Co-op Association (NFCA) has been a partner in the UMass Co-operative Enterprise Collaboration, which includes the Valley Alliance of Worker Co-ops (VAWC) and the UMass Amherst Department of Economics, to develop courses on co-ops and a certificate that not only offers students an opportunity for hands-on learning, but also enables co-ops to engage the next generation and explore new strategies for success. This year, intern Kenyon Kowalski focused on “Social Media & Community Engagement,” conducting an audit of Neighboring Food Co-op’s internet presence and social media channels to develop recommendations on how the NFCA can use our presence to serve Member Co-ops, provide content, and support shared impact. Mary Sayah worked on “Sourcing & Economic Inclusion,” exploring how product mix and services offered by food co-ops can influence inclusiveness, reflect their mission, and appeal to diverse member and shopper needs. Michael Tran focused his internship on “Food Co-op Start-Ups & Economic Inclusion,” researching the potential of food co-ops in immigrant communities with a focus on the methodology of start-ups and the challenges and opportunities of working with marginalized communities. Owen Wright’s project, “Food Co-op Impact Data” involved working with NFCA food co-ops to update our impact statistics for 2017, with a focus on an analysis of the progress of the co-ops included in our original study 10 years ago. The NFCA’s work with the UMass Co-operative Enterprise Collaborative is part of the commitment of our co-ops to education and to engaging the next generation of co-operators in the success of our movement. Spring has arrived! Our farmers are working hard to bring us fresh fruits and vegetables this season. While we wait for the seasonal harvest, we can still enjoy variety of local vegetables for healthy family meals. Your local food co-op has the ingredients you need for making soups, stir-fries, and special meals including our frozen fruits and vegetables to keep it local and easy to prepare. Throughout May, our Northeast Grown frozen products are on sale at participating food co-ops–a great time to try them, stock up! By working together, food co-ops across our region are making regionally grown produce available to our shoppers year ‘round. Neighboring Food Co-op Association (NFCA) Blueberries, Organic Broccoli, Organic Edamame, Organic Green Beans, and non-GMO Sweet Corn–are all grown and packaged right here in the Northeast, and available only at your food co-op! 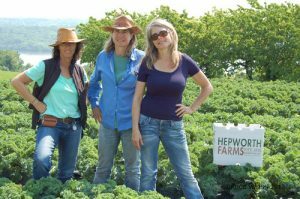 Amy and Gail Hepworth and Gerry Greco of Hepworth Farm, a seventh-generation family farm that includes 250 acres of NOFA-certified land yielding more than 400 varieties of organic vegetables, are the growers of our organic broccoli. Eat healthy and support family farmers all year long with delicious produce from our region. Look for our Northeast Grown Frozen Fruits and Vegetables in the freezer section. They’re easy to find because they’re packed in a clear package so you can see what’s inside! For more Farm to Freezer information and recipes–including a frittata recipe great for spring family celebrations using frozen corn, broccoli, or edamame–visit: www.nfca.coop/farmtofreezer. Looking for a great cheese to share with family and friends? Try Oh My Gouda, it’s perfect for melting and imparts a smooth and buttery flavor. Cobb Hill is an intentionally planned community in Hartland Four Corners. In 1997, two local dairy farms were purchased and merged into a 260 acre co-operative community and farm. Oh My Gouda is a washed curd cheese aged 3 to 4 months and is based on a Dutch Gouda recipe. This sweet and nutty natural rind cheese is made with rich and creamy raw Jersey cow milk. 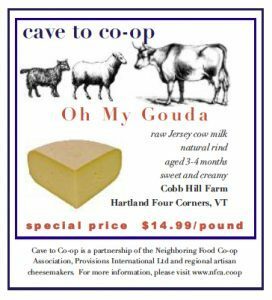 Cave to Co-op t is a partnership between Provisions International and the Neighboring Food Co-op Association (NFCA) to support artisanal cheese producers in our region and make their products more easily available to co-op shoppers. Each month, a delicious local cheese is featured at a great price. The Neighboring Food Co-op Association (NFCA) is a co-operative federation of 35 food co-ops and start-up initiatives across New England, working together toward a shared vision of a thriving co-operative economy, rooted in a healthy, just, and sustainable food system and a vibrant community of co-operative enterprise.